This I-Spy Swap is now full! It will probably be a while before I host another swap, but if you are interested in future I-Spy Swaps, you can fill out the form at the bottom of this post to be notified by email next time there is a swap. Filling out the form DOES NOT guarantee a spot in the next swap. Truth be told...I don't really need anymore I-Spy squares at the moment...but I'd promised quite a few people that we'd be having another one soon, so I thought we'd go ahead and do one more in time for you to get squares if you need them for Christmas gifts. Plus, Patty from You Keep Me in Stitches has generously offered to be the official sponsor of this swap. She has lots of fabric, including enough I-Spy fabrics to fill two spots to provide squares for quilts to be donated to Katie's Comforters who provides handmade quilts and blankets to the children of Seattle Children's Hospital. 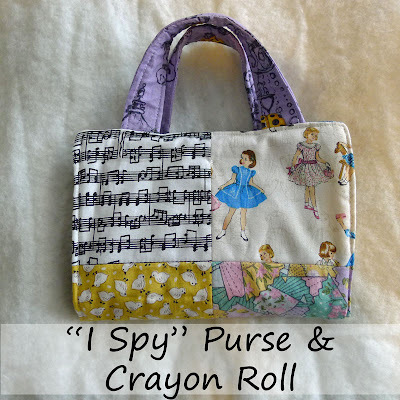 Patty still has lots of I-Spy fabrics left to choose from in her shop, so be sure to stop by and take a peak. 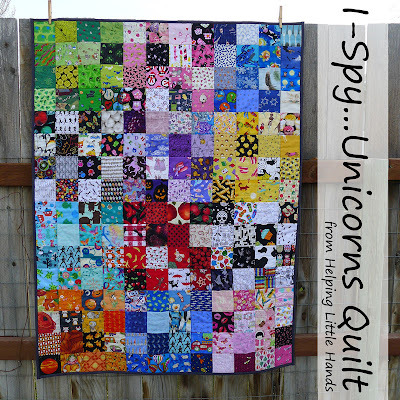 I've made quite a few I-Spy quilts and other I-Spy projects this year and I can definitely say, they're fast, easy, and kids LOVE them. 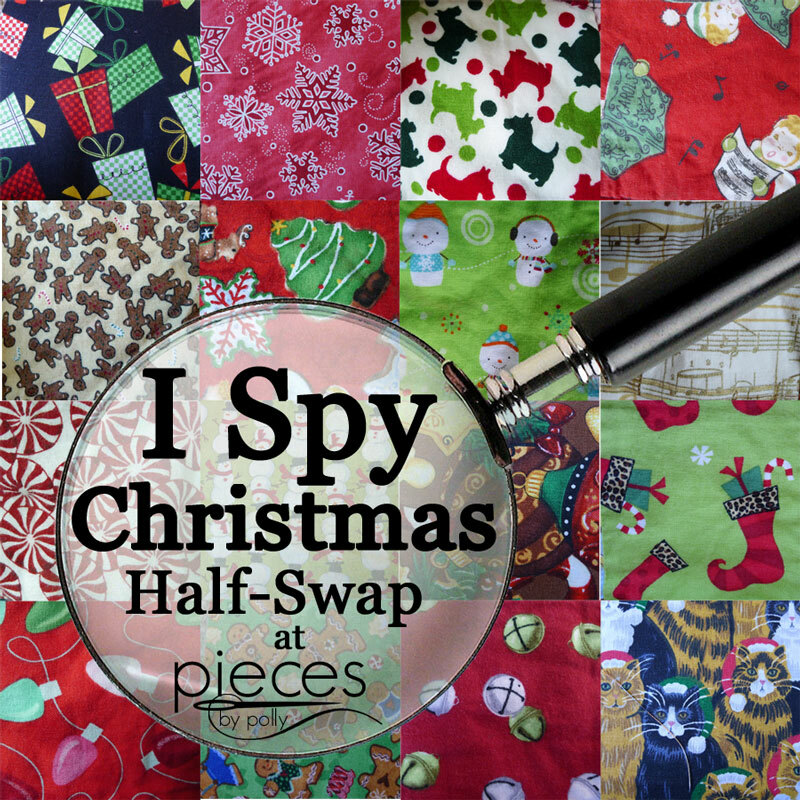 And speaking of Christmas...I thought we'd throw in a I-Spy Christmas Half-Swap if you're interested in getting some Christmas themed squares. And as a little sneak peak...I'll have another I-Spy project ready to show you soon. Becca and I have been finishing a themed quilt up this week. Mail 200 I-Spy squares to me by Sept. 30th. Get 200 I-Spy squares back, all different, by October 10th. 1. Since this is the last swap I'll be doing for quite a while, and the last swap filled up so quickly that some people didn't get in, I'll do my best to keep sign-ups open for at least 2 days, even if it means opening up a third swap. 2. For each spot you sign up for, you will need to cut 20 4" squares out of each of 10 different novelty print quilt fabrics (NO flannel or textured fabric!). 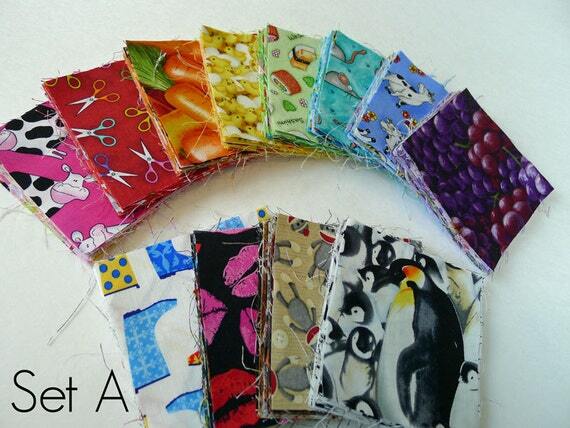 A 1/4-yard cut or fat quarter will get you 20 4" squares, so you will be purchasing a total of about 2 1/2 yards of fabric. This is NOTHING when you think about all the different squares you will be getting back! 3. In order to avoid duplicates, everyone will need to search out unusual or obscure prints. Look for things that aren't available at chain stores. But, please, pick FUN ones! If you love it, the other swappers will love it too! 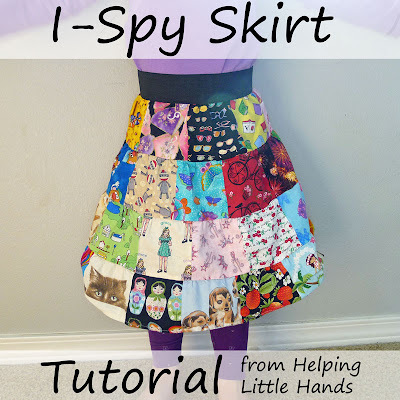 Please upload pictures of your fabric choices to the HLH I-Spy Swap flickr group as soon as possible after ordering and check the flickr group before you place your order. (If you order fabric online, many smaller shops will send you a picture.) If you're not able to post to the flickr group for some reason, email me the picture and I will add it. Please put Swap 4 somewhere in the picture title, so there will not be confusion with our last swap. I'll be deleting the previous swaps pictures soon. 7. For the Christmas Half-Swap, you will send in 20 squares of 5 different Christmas/Winter themed squares for a total of 100 different squares. You can sign up for 2 spots in the same swap. I really don't know how much interest there will be in a themed swap, so if this swap doesn't completely fill up, then I will swap with the fabrics I have and you may end up with some duplicates. If you sign up for 2 spots, you must send in different fabrics for each spot, but you would end up receiving a 2 of the same sets of 100 in return, since there will be just a single Christmas swap. 8. 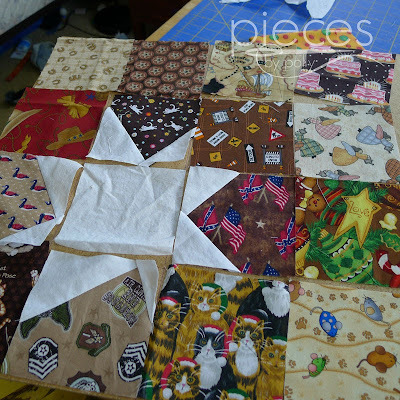 If a swap doesn't completely fill up, then I'll swap with the squares I have and you may end up with a few duplicates. 9. Same general rules apply as for a regular swap...keep it quilting fabric, no licensed prints, etc. PLEASE BE SERIOUS AND BE SURE YOU CAN MEET THE DEADLINES BEFORE signing up. I want to make sure everyone gets their squares back in time for Christmas gifts, so if I don't receive your squares on time, you will miss out. I signed up on for one regular and 1 Christmas. Yay! So excited! Thanks for hosting another swap Polly! Looking forward to this swap! I already have my regular squares... now to find some Christmas ones! I signed up with the form. Thanks for including me in the email. I am really looking forward to this swap. I was always too late to join in the other swaps. Thanks so much for doing another one. I signed up for one spot for the regular swap, but now I think I have found enough fabric for two. Can you add a second spot to my listing? Thanks! I signed up for two spots in the i-spy and 1 spot in the christmas swap!! How exciting!! Thank you for hosting!! I was so excited to see the swap open! I signed up for one spot right away! Polly can you clarify are we now sending 20 pieces of 10 different Christmas fabrics due to the popularity of this swap? Or still just the 5 fabrics? Of course, the days I don't check my blogroll, that's the day you post the i-spy swap I've been hoping to catch!! I was hoping that in the comments there would be enough interest for a 3rd swap, but can you put me on the list in case someone has to drop out? I've been stashing fat quarters so that I would be ready when a swap was available, so if you need to fill a spot, I'm ready and waiting in the wings!! Hi Polly, I just signed up for the Christmas swap, at least I think I did! Do you email out the mailing address and other information? I'm hoping for a confirmation email or something, as this is the first time I have done a swap with you! Thanks! Hi Polly! So I just signed up for a second Christmas swap spot. Silly me thought I didn't have enough Christmas fabrics that I couldn't do two, what was I thinking? ;) I think I have some great fabrics for it.